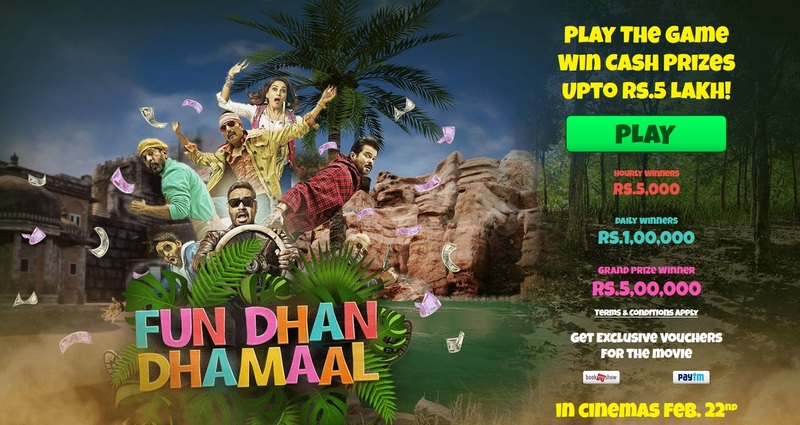 This Game (Fun Dhan Dhamaal) is being conducted/organised by Star India Private Limited, through its division Fox Star Studios. The Game will be active during the period commencing from February 7, 2019 and ending on February 16, 2019. The Game is a game of knowledge and skill whereby the Participants would have to go through ten levels where each level the participant will have to collect cash bundles and answer questions. The questions will be based on the Total Dhamaal movie and will require the participant to watch the trailer to know the answer to the questions. Each level be of 60 seconds and the first 9 levels can be played unlimited times once they are active. The bonus level can be played only once. The editorial team of Fox Star shall select 12 hourly winners via randomizer for levels 1 to 9, from amongst all those Participants who are playing at each hour (the participant should be playing the particular level at that particular hour to be eligible for the lucky draw. To be eligible for an hourly prize from 1:00 pm to 2:00 pm on the day of level 3 release, the participant should be playing level 3 during 1:00 pm to 2:00 pm), 1 (one) daily prize to the participant who has the highest score on the corresponding level for that day and a grand winner who will have the highest score at the end of the game period. The Prize for the Hourly Winners is Rs. 5,000 (Five Thousand only). The Daily Prize Winner gets Rs 1,00,000 (One Lakh only) and the Grand Prize Winner gets Rs. 5,00,000 (5 Lakh only). ** The Prize must be claimed in response to messages or telephone calls made to the Winners. ** Any and all taxes and/or levies applicable under the laws of India and any incidental costs direct and/or indirect, in relation to Prize shall be borne by the respective Winners. ** Fox Star shall not be responsible or liable for any technical disruption, failure and/or any other difficulties of such nature, due to which the Winner(s) is unable to claim the Prize from Fox Star. ** In case any loss/damage etc. is caused to or incurred by the Prize(s) during transit or otherwise, Fox Star will not be liable for any such loss/damage etc. ** Further, Fox Star shall not be held liable for any failure and/or any other defect in or damage to the Prize, if any, whether caused during transit or otherwise. ** Fox Star shall have the right to declare any other Participant(s) as the Winner(s) of the Contest, at its discretion and transfer Prize(s) to such other Participants. ** All Prizes are provided on an as-is where-is basis without assurances or warranties of any kind. ** The Winner agrees that the Prize cannot be transferred, negotiated, refunded or exchanged. ** It is clarified that no other gratification, cash equivalent of the Prize or alternative prize will be awarded to the Winner(s). ** The Contest or the Prize(s) cannot be combined with any other contest or activity. ** If the Winner(s) refuses to accept the Prize awarded, Fox Star shall be released from all obligations towards the Winner(s) in connection to the same or otherwise. ** Fox Star shall not be responsible in the event that the Participant cannot complete the game due to any network problem, breakdown in machinery or any other technical error of any nature whatsoever. ** The Participant/Winner acknowledges that in case the conduct of the Contest cannot be fulfilled due to any reason, including reasons beyond the control of Fox Star such as war, industrial action, flood or any act of God, then Fox Star shall not have any liability in this connection. ** Fox Star is in no manner whatsoever responsible and/or shall not be held liable in any manner whatsoever, for any physical injury, death, mental and/or emotional trauma caused to the Participant in any manner whatsoever, in connection to the Contest. ** Employees of and/ or consultants of Fox Star and/or persons hired on contract by Fox Star, the sponsor, and the members of their immediate family, are ineligible to participate in the Contest. I like this movie very much. Tell me, how to play total dhamal game? This movie is very good. Best movie of the world. Please tell, how to play total damaal game?